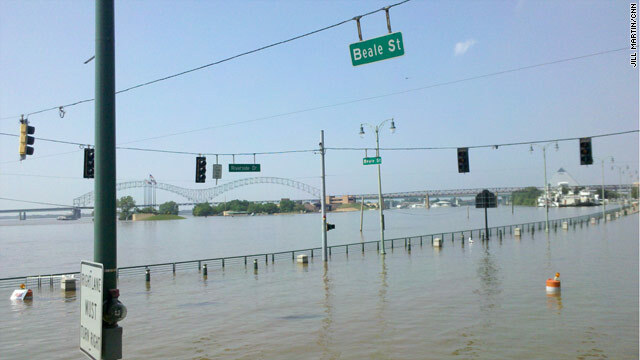 Some roads near downtown Memphis, Tennessee, were flooded Sunday. The Mississippi River is expected to crest in Memphis on Tuesday morning. In the Memphis area, where people in 1,100 trailers and homes in low-lying areas already have been told to evacuate, the Mississippi River is expected to crest at 48 feet - just under the 48.7-foot record set in 1937 - on Tuesday morning, the National Weather Service says. On Sunday morning, the Mississippi had already reached 47.3 feet. Although downtown Memphis isn't expected to have serious damage from the flooding, some Memphis-area streets near the river already are underwater, according to the weather service. The weather service says the river may not fall below flood stage until June. The flooding in the Mississippi and Ohio river valleys has already forced people from their homes in Missouri, Illinois, Indiana, Tennessee, Kentucky and Arkansas. The United States and Pakistan is sorting through their complicated relationship after last week's U.S. raid that killed Osama bin Laden in a compound in Abbottabad, Pakistan. Pakistan's prime minister, Yousuf Raza Gilani, is expected to deliver a new terrorism-related policy statement Monday as the Pakistani parliament opens a debate on the U.S. raid. U.S. officials say Pakistan is a critical ally in the fight against terrorism, but they're also demanding answers to questions about bin Laden's presence in that country over what they say was the last six years. Pakistani leaders say they didn't take part in either the establishment or the maintenance of bin Laden's safe haven. Pakistan's U.S. ambassador, Husain Haqqani, told ABC on Sunday that the United States shouldn't have conducted a raid in Pakistan without Islamabad's awareness or consent. Meanwhile, a U.S. task force is combing through material that U.S. commandos took from bin Laden's Abbottabad compound. It's unclear what information the federal government might release from that material, or when it would do it. But the government already has released videos of bin Laden and information about preliminary discussions of a rail threat. The United Nations' humanitarian chief on Monday is expected to brief the U.N. Security Council on the battles between government forces and rebels in Libya. Misrata - a rebel-held city that government forces have besieged and shelled for weeks - is expected to be part of briefing. The U.N. Security Council authorized nations to enforce a no-fly zone over Libya and take "all necessary measures" short of an occupying force to protect Libyan civilians from attack by government forces. Planes from NATO, which took control of coalition airstrikes in late March, still are targeting pro-government forces, hitting tanks, other military vehicles and an ammunition storage site on Sunday alone. Another matter to keep an eye on this week: Libyan rebels say Italy has agreed to arm them, but the Italian Foreign Ministry has denied that it will send weapons to Libya. A press office spokesman said Italy will only go as far as sending nonlethal material, such as satellite and radar systems. A trial of three American hikers charged with espionage in Iran is expected to resume on Wednesday after a three-month break. The three were hiking together in Iraq's Kurdistan region when they were detained by Iranian border forces on July 31, 2009, for allegedly crossing into Iran illegally. Shane Bauer, 28; Sarah Shourd, 32; and Josh Fattal, 28, were charged with spying. They have pleaded not guilty. Shourd returned to the United States in September after being released on $500,000 bail because of a medical condition. She said she will not return to Iran, which has said she will be tried in absentia. Iran has held Bauer and Fattal since their 2009 arrests. The United States' first full face transplant recipient is scheduled to leave a Boston hospital on Monday, about two months after the 15-hour procedure. Dallas Wiens, of Texas, received the transplant in mid-March, more than two years after he was injured by a high-voltage line. The forehead, nasal structure, nose, lips, facial skin and underlying muscles and nerves were transplanted. Wiens is the second person in the world to receive a full face transplant. The first such transplant happened in Spain last year. A verdict is possible late this week in the trial of a retired U.S. autoworker accused of being an accessory to murder as a guard at a concentration camp during World War II. John Demjanjuk, now in his early 90s, is on trial in Munich, Germany, having been extradited from the United States in 2009. The native Ukrainian emigrated to the United States in the 1950s, settling in Cleveland. Accusations against Demjanjuk date to the late 1970s. Two lawsuits challenging the United States' 2010 health care reform law will be heard Tuesday in a federal appeals court in Richmond, Virginia. A number of state and private challenges have been made against the Patient Protection and Affordable Care Act; the legal war is expected to eventually end up in the Supreme Court. Federal judges so far have split on whether a key provision - the "individual mandate" requiring most Americans to purchase health insurance by 2014 or face financial penalties - is constitutional. U.S. President Barack Obama is expected to deliver a speech promoting comprehensive immigration reform on Tuesday in El Paso, Texas. The speech comes about six months after the DREAM Act, an immigration reform proposal, was defeated by a Republican filibuster in the Senate. Some immigration reform advocates have argued that Obama could bypass Congress and issue an executive order to bring changes intended to help children of illegal immigrants eventually gain U.S. citizenship. But Obama appeared to rule out acting on his own last month. First,Pakistan is playing the old misdirection trick.They have managed to put the attention on us as to why we conducted a military operation in their country without their knowledge,taking the spotlight off of what should be the real issue.What was Bin Laden doing living in Pakistan for 5 plus years without "detection"? Lets redirect the subject where it belongs.Second,God doesnt distinguish poor people or poor areas from others.To blame God for something we cant understand is pitiful.I think its odd how the so called atheist are the first to acknowledge the exsistance of God after the event of a "natural" disaster. "God hates poor peolpe." "God is a mean god." "If God really cares,then why does he allow these things to happen?" Why not say these things about Karma? "Wow! These people must have really been bad in their previous lives." Or blame it on evolution. "These people died because its just part of the natural selection and they just happened to be the ones in line to die next." Blame God?Really? Sorry don't buy Karma either, life is what it is and that's all. Prove me wrong yeah didn't think you could. Hey Dan Smith.This is a typical atheist ploy.Hmm.Sounds just like what Pakistan is doing.Misdirection.I am content in my faith and belief in God but atheist just have to chime in and call us(Christians,and other faiths)ignorant or simple minded.If you are so intent on trying to make our faiths out to be false,then the burden of proof or disproof is on you.Either prove there is no God or leave us to our religions.And dont give me that religion kills jazz.Christians does more to help devistated areas and peoples than ANY other organizations on earth! I'll believe what I want to believe. I won't foist my beliefs on you if you don't foist your beliefs on me. "Want to believe" is a wonderful phrase. I just wrote a sentence, so expect the Troll Hagen to start in shortly with his filthy mouth and quick but rotting brain. I am very flattered that he hates me so much. May 21 2011 will be the beginning of God's judgment. This happens to be the 2nd month of the 17th day of the hebrew calandar. The exact day Noah entered the ark 4990BC. This will be exactly 7000 years to the day. You must subtract 1 year because there was never a year "0". God gave Noah a 7 day warning. God said as it was in the days of Noah so shall it be. God said not to be ignorant of this one thing, one day is as a thousand years and a thousand years as one day. For more information about May 21 2011 just go to wecanknow.com or just google May 21 2011. There is 13 days left. When the Ninivites got word of time and judgment, they cried mightily unto God for mercy saying, who can tell, maybe God would have mercy. We too can cry out for mercy, who can tell, maybe God will have mercy. There is a story on ABC news today about judgment day. They interview a few people about May 21 2011. Very interesting story. CNN did a story a couple months back about May 21 2011. The message is getting out. There are 13 days left till May 21 2011, as the Ninivites did, we can cry mightily unto God for mercy, who can tell, maybe God will have mercy.